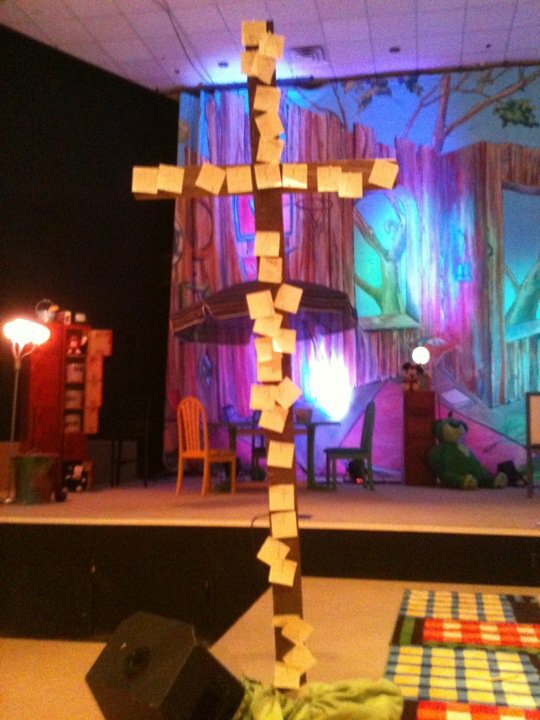 This week in our KidTown services, we spoke about the cross. In as vivid a way as possible, I told kids what happened when Jesus died on that Friday. And that He did it all for them. In a room filled with nearly 300 kids, not a sound could be heard. They listened, intently, the whole time. When it was over, I reminded them of this: Jesus put you first when He died on the cross. And then we handed every kid a pencil and a Post-It® Note. I encouraged them to write something on that piece of paper–maybe it was something they’d been feeling guilty about for a long time, or a sin they needed to confess, or maybe just an expression of gratitude for the fact that Jesus “did nothing out of selfish ambition or vain conceit” but thought of them when He was nailed to the cross. Then the kids took those notes and “nailed” them to the cross. (We used pushpins–I’m smart enough to know that a hammer and nail in the hands of a 2nd grade boy is a bad idea.) And one by one, they came up and nailed their sins to the cross. It was a powerful moment. Humbling. Inspiring. But even more humbling, inspiring, and heartbreaking was reading a sample of the notes after I took the cross down. It reminded me that kids don’t live an idyllic life. They deal with guilt. With fear and worry. They deal with sin, just like their parents. And they are in as desperate need of a Savior as the drug dealer or Hollywood star. A sample of their confessions. Reading them brought tears to my eyes. Please forgive me for lying to my dad. Lying. What happened at Liam’s. Thank you for everything. Forgive me for looking at stuff on the internet. Forgive me for cutting my hair. Dear Lord, will you forgive me for being a jerk to my family? I am sorry for cussing and swareing everywhere. Lord, forgive me because I still feel awful for stealing money 3 years ago. The beauty of the cross is that the guilt and burdens we bear–no matter how old–or how young–we are, are covered in the blood of Jesus. His death that Friday was because His love is so great that He doesn’t want anything to keep us from Him. It’s my prayer that, for these kids, this last Sunday became the day–the beginning–of a life where they realize that their sins can be forgiven, that Jesus loves them so much, that the guilt they live with can be taken and nailed to the cross. It’s my prayer that I never forget the awesome joy and responsibility I have as their pastor. Looking forward to sharing the story of Christ’s resurrection with them this Sunday.